The Border Collie is one of the most intelligent, versatile, and athletic breeds that love having a job to do. 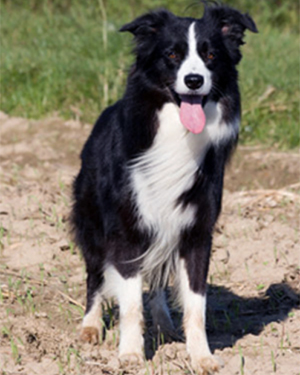 The Border Collie was developed in the Anglo-Scottish border region for herding livestock, especially sheep. It was specifically bred for intelligence and obedience. Given their intelligence, energy, and athletic nature, they frequently compete with great success in sheepdog trials and dog sports. No one should expect a Border Collie to be satisfied being an outdoor, backyard dog, as they prefer to be with their families at all times. They need a strong handler who can teach the dog what is expected and require compliance. Give an inch, a Border will take a mile. The Border Collie is a study in contrasts. They have a great sense of humor, yet can also be an extremely intense, serious worker. They are gentle and loving, but can also be a whirling dervish. This breed is always eager to perform. They love having jobs to do, and will always do them to the best of their ability – with a flair, and at top speed. But good training and direction is needed. They are not born to be obedience competitors or movie stars. 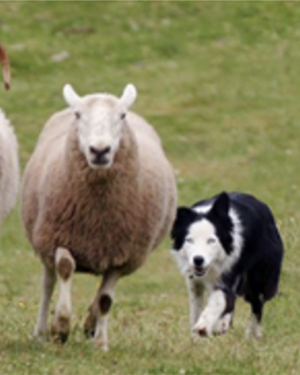 Sheep herding training classes are available locally and are extremely rewarding for this breed, and even for novice owners who are looking for a little fun recreation. Experienced, confident dog owners who will set rules and be in charge. Owners with the time and energy to keep up with such an active breed. People willing to give their dogs regular jobs and ongoing training to avoid boredom. People who like to engage their dog in conversation; a Border Collie is an avid listener who can grasp an impressive range of vocabulary. Inactive owners who cannot commit to providing daily mental and physical exercise. People unable to occupy the Border Collie’s active mind. Apartment dwellers who cannot commit to frequent attention and exercise on a daily basis. People who lack dog obedience training skills or the willingness to participate in obedience classes. Owners who are not interested in athletic activities with their dog. Very intelligent and easy to train, affectionate, athletic, fast. Love taking direction—this dog will never say “no thanks!” They can be quiet and calm inside the house, and seldom bark. They tend to stay home, rather than wander. Observant and intuitive (may read your mind). Eager to “go” and “do” anything. Extremely versatile. Comes when called. Listens closely, pays attention. Devoted to family. Very observant and intuitive. Learns quickly (good and bad). Gives the best hugs. Very focused on the owner rather than other dogs or people. They are sensitive and will pout after a correction. They can be protective of family and home, so they will need proper training to establish their limits. Due to their innate herding instincts, the Border Collie is noted for nipping running children, motorcycles, lawnmowers, bicycles, trucks and cars—this must never be tolerated. Their high intelligence can cause obsessive-compulsive behaviors and a dog that demands to “work” or “play.” High energy demands require daily off-leash (yet controlled) running. Very sight and sound sensitive, which can lead to quirky behaviors (such as unrealistic fear or aggression) because of moving shadows, bugs, sneezing, coughing, clapping, toaster popping, ringing bells, ringing phone, vacuum, hair dryer, thunder and lightening, gunshots or fireworks. Can jump fences. Average of 30 to 50 pounds, between 18″ and 22″ tall at the shoulder. Five colors: black and white, red and white, sable, tri-color, or blue merle. NOT recommended for families with children under 12 (generally). Good with other dogs, can be obsessed with cat-chasing, and should not be left alone unsupervised with small animals (gerbils, guinea-pigs, birds). 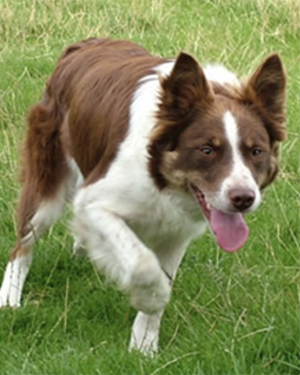 A most versatile athletic breed: High-scoring obedience competitor, as well as sheep-herding, agility, flyball, tracking, search and rescue, frisbee. They tend to love boating, swimming, hiking, jogging, camping, and retrieving balls. Minimal grooming required. They don’t mind getting muddy, so regular bathing will be necessary. 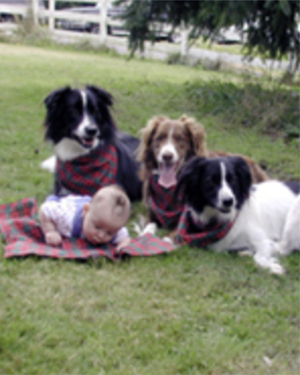 Genetic diseases known to affect Border Collies include eye disorders (Progressive Retinal Atrophy, and Collie Eye Anomaly; dogs should be checked by a certified canine ophthalmologist); hip displasia, and epilepsy. Athletic injuries are fairly common.